With protection in mind, this dual holster monster of a tank will protect your LG G3 from any possible nuclear war. 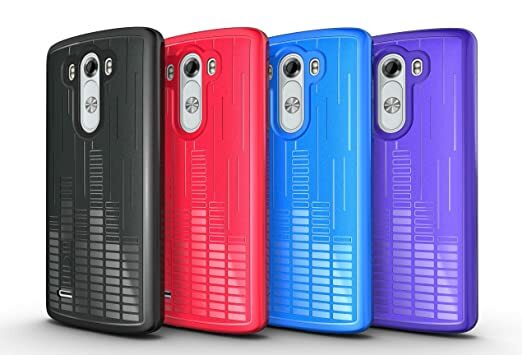 This beautifully designed inner case is made of silicone making it light weight and a great shock absorbent, the second layer is hard plastic and also acts as a stand allowing you to watch movies on the large 5.5 inch display in a comfortable way. Oh and it also has 1 year of warranty. Check it out on Amazon. What is this case missing? Mainly standing out because of its shape, the sleeve is a great way to protect your G3 from any damage and keep it clean. We all have that moment where we are eating french fries and our fingers get all over the screen, acting like a lubricant, the Sleeve will keep your device clean and in an incredibly stylish way. The fitbag is available in more then 20 colors, check it out here. What is less awesome about this case? Our number 1 on the list is a big case and our number 2 is one that pretty much hides your smartphone, but what if you love the design of the G3? Then the Tudia Ultra slim is one worth checking out, available in a ton of colors, this ultra thin case made of TPU material will give it a soft touch but still protect your device from scratches and minor drops. Check it out here. What is this case missing? What is your favorite case? Think we are missing one on the list? Let us know in a comment bellow! Cruzerlite! Had it for my Galaxy S3, s4, and now my LG G3. Perfect fit, gives a great grip, and also it looks great with the Andy the Android on the back! Incipio Dual Pro looks great and gives a snug fit. Was the only case I ever bought right on the spot and not compare others once it was on my phone. Welcomed and good luck on whatever case you choose.